A proposal for an apartment complex without parking in Phinney Ridge has generated pushback from residents who say that’s unrealistic. Officials, meanwhile, say they are crucial as the city grows. The path to demolition for the dilapidated site of a former dive bar on Seattle’s Greenwood Avenue started like many cases of redevelopment during this massive growth spurt. Neighbors lamented the building’s closures: the Stumbling Goat Bistro and Ed’s Kort Haus bar. Eager developers moved in. City officials reviewed preliminary plans for teardown around this time last year, and construction on a four-story mixed-use complex with 55 micro-apartments was on track to begin. But the building at 6726 Greenwood Ave. N., between apartments and covered in graffiti, remains untouched by construction after neighborhood activists launched a battle with city planners and developers over the project’s design. The residents’ beef: Developers do not plan to build any parking. 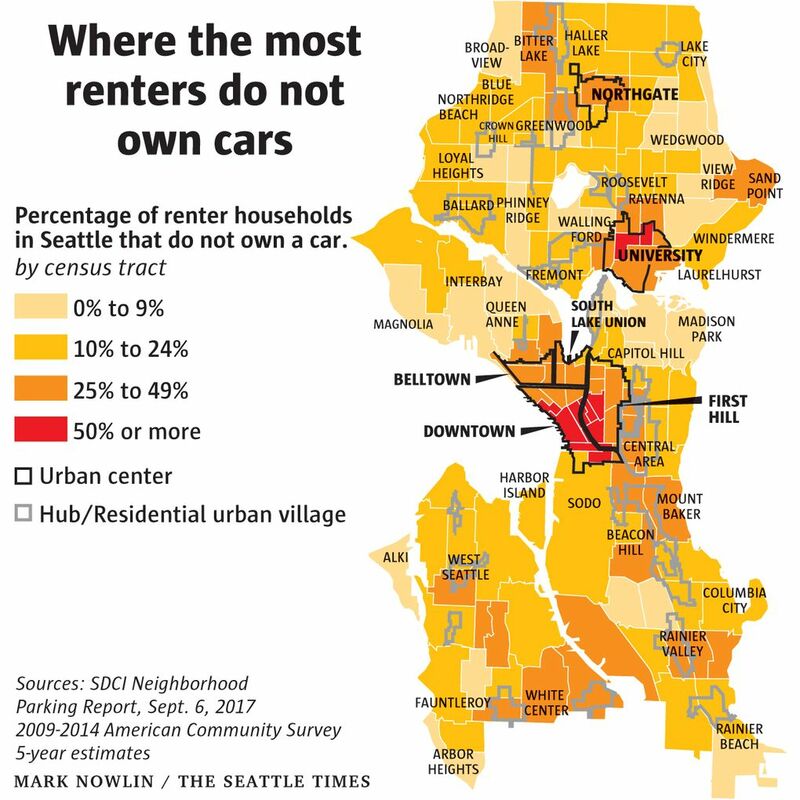 In downtown and select areas near public transit stops across Seattle, nearly one-third of new apartments do not provide space for cars under years-old parking-optional regulations that aim to drive down construction costs so developers can build more housing. The argument is that more and more renters with access to public transit are going car-free. But opponents of the Greenwood Avenue project, called Phinney Flats, say the lack of off-street parking will force vehicles onto already congested streets. Renters are not giving up cars at the rate city officials would like to believe, they say. “You simply need to produce parking on site. Period,” said Irene Wall, who is a Phinney Ridge homeowner, longtime land-use activist and leader of Livable Phinney, which formed to fight the apartment complex. The debate over the project has raised long-standing questions, with new urgency, over Seattleites’ reliance on personal cars. According to the city, about 40 to 48 percent of renter households in the city’s neighborhoods with the most multifamily housing already get around without owning cars, and city planners expect that number to grow. 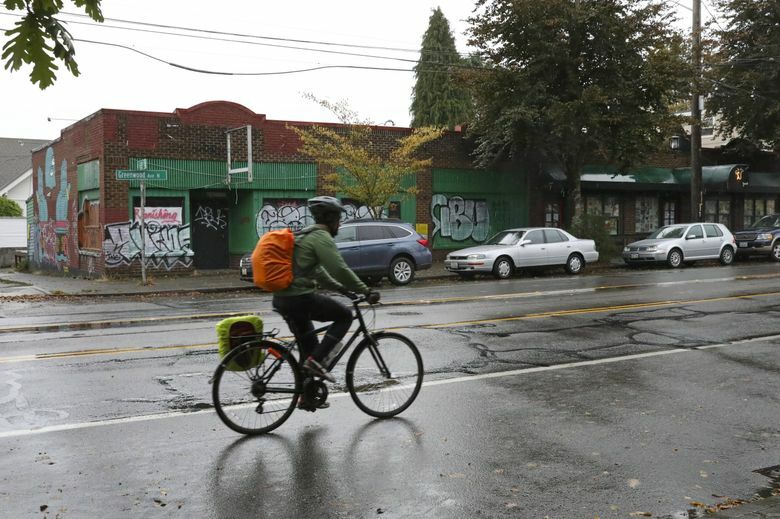 The proposed Phinney Flats building would have ground-floor businesses, two live-work units and 55 apartments around 300 square feet each — matching the look of other new buildings on the street, according to developer Johnson & Carr. Demand for such micro-apartments in Seattle is on the rise, as people scramble for cheaper places to live amid soaring rents. Developer Kelten Johnson said the project, in the Phinney Ridge neighborhood, “reflects the city’s affordability and livability goals” by allowing the company to spend money on housing units instead of parking spaces. Livable Phinney filed an appeal with the city of Seattle over the proposal early this year, setting off months of legal proceedings that stalled Johnson & Carr’s permit application. Meanwhile, city officials proposed a tweak to Seattle’s zoning code that would nullify opponents’ key argument, as well as slightly expand the area in which new residential projects are not required to provide parking. 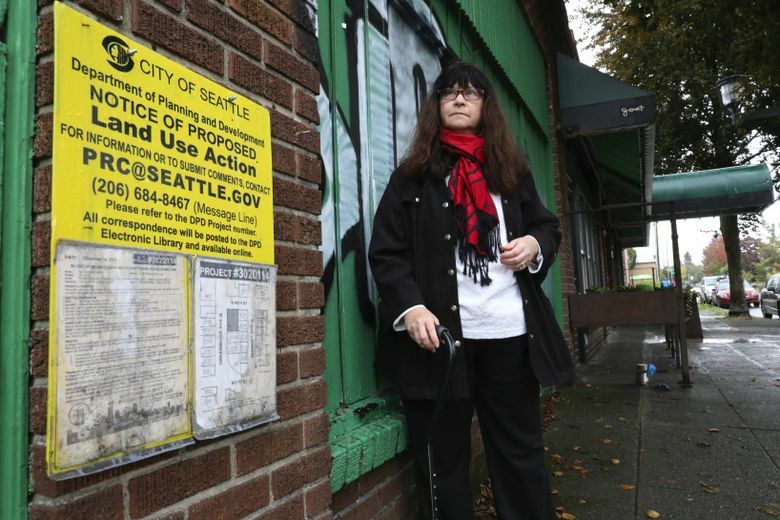 The Phinney Ridge proposal has become a rallying point for activists throughout Seattle who oppose the regulations allowing some developers to forgo off-street parking. Under rules first adopted about a decade ago, apartments built near “frequent transit service” don’t have to include parking. Supporters say that allows developers to best utilize space as the city becomes denser and public transit improves. Also, research suggests a significant number of existing parking spaces in apartments go unused. Meanwhile, the cost of building parking often falls on tenants in the form of higher rents. Parking can cost from $30,000 to $50,000 per stall to construct, according to the city. 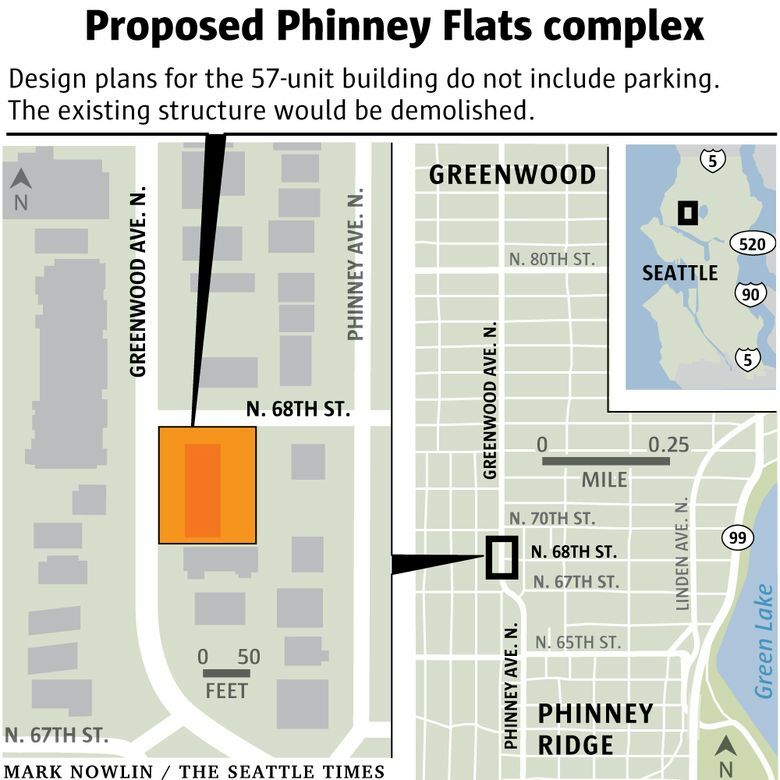 Johnson said the “tiny lot” on Phinney Ridge would accommodate only a handful of parking spaces. But the neighbors say the parking regulations are unrealistic and misguided. They also argue that a lack of on-site parking disproportionately affects people who must rely on cars to get around, such as parents with young children. “The people who live here and have lived here for decades, our voices are being obliterated by the bureaucracy that’s going on in our neighborhoods,” Wall said. A native Seattleite and employee of an engineering firm, Wall has a thick portfolio of land-use activism, including opposing a parking garage at Woodland Park Zoo about a decade ago and a 400-room hotel along the waterfront in the late 1990s. She and two volunteers lead the Livable Phinney group, representing hundreds of residents they say have similar concerns over parking and development in the neighborhood and across the city. Donations from about 250 supporters have helped pay the group’s legal fees, topping $40,000, Wall said. The crux of Livable Phinney’s argument rested on the definition of “frequent transit service” in Seattle’s zoning code. Currently, that’s defined, in part, as a bus arriving in at least one direction every 15 minutes or less for most of the day. But Livable Phinney argued that is not the case for the bus route nearest the Phinney Flats project. A study by the group determined buses on that route, the No. 5, arrive less often than every 15 minutes about 40 percent of the time. Development outside of the frequent transit-service areas must provide minimum parking for tenants, customers or employees based on the building’s use. For apartments, that typically means one stall per housing unit, said Bryan Stevens, spokesman for the Seattle Department of Construction and Inspections (SDCI). Some parts of the city require parking for only half the units in apartment buildings. A handful of other major cities have similar rules on reduced or optional parking for developers. A hearing examiner in July sided with Livable Phinney over its argument about frequent transit service matching bus arrival times, spurring an appeal from the developer. But on Monday, Johnson & Carr dropped the challenge in King County Superior Court, saying they accept the decision. The SDCI, meanwhile, introduced a package of changes to various parking rules that include essentially raising the 15-minute standard to 18 minutes. The proposal also would base the rule on King County Metro’s bus schedule, not actual arrival times. The change would allow buses flexibility “for reasons such as traffic congestion, or schedule coordination to facilitate transfers,” the proposal says. City Councilmember Rob Johnson, who chairs the City Council’s committee for land use and zoning, said that recommendation is in response to the Phinney Flats controversy. Wall described SDCI’s proposal as “changing the rules of the game when you lose,” and Livable Phinney will rally to fight aspects of the legislation. After Johnson & Carr’s dropping the appeal of the hearing examiner’s ruling, the developers and the city will now take another look at whether the project conforms to existing city code, said Stevens. SDCI’s proposal also slightly expands the area in which the parking regulations apply — all of downtown and places in Ballard, Fremont, University District, Northgate, West Seattle, Columbia City, Beacon Hill and Rainier Beach. Seattle Mayor Tim Burgess has reviewed the proposed parking changes, including the definition of frequent transit service, and sent them to the City Council, the mayor’s office said Wednesday. Officials expect the land-use and zoning committee to review the proposal next month. Seattle will likely see more and more buildings without on-site parking in the coming years, as planners adjust neighborhood zoning for Sound Transit 3’s light-rail and bus expansions and King County Metro Transit’s bolstered bus service via voter-approved tax increases.